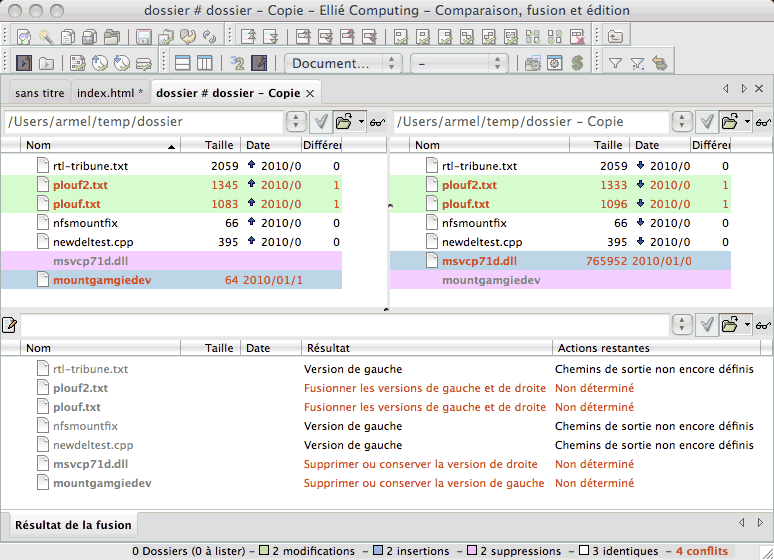 Ellié Computing Merge compares folders, differences are displayed using background colours under the files names, a legend placed in the status bar is visible at any time and shows you the color code together with comparison statistics. The comparison operates on metadata alone (size, date...), on the files content or both to ally rapidity and flexibility of comparison. You can update one version by simply dragging and dropping the other's version files and folders on top of it. You just have to double-click a file to run a file comparison with its counterpart. ECMerge compares files particularly fast thanks to its parallel comparison engine, each core is used at the maximum of its capabilities!